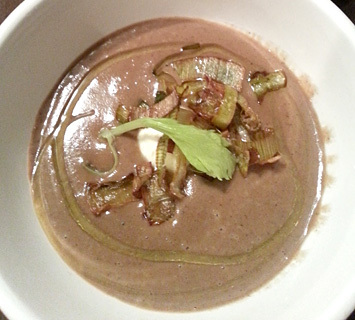 parsnip soup | Have YOU Ben Starr Struck? We wanted to draw inspiration from our previous menu, but also introduce some new elements and additional courses, including some of our now-signature housemade cheeses. We were just coming off the tails of our 3-seating epic Bread-themed menu from Dec 13-15 and had less that 2 weeks to dream up the menu and cook for 4 holiday seatings Dec 27-29 and Dec 31. We had never done 4 back-to-back FRANKs before, but that extra prep day on Dec 30 would definitely help, and our Dec 31 menu would be expanded from the menus on the previous weekend because we were asking for a higher donation for that seating due to the holiday. That didn’t leave us much time to conceptualize before we’d have to start sourcing and preparing, so as soon as we finished wrapping up FRANK business on that Monday, we headed out to The Truckyard, a funky outdoor dining spot new on the Dallas scene, where food trucks cycle through what is basically a playground for adults, with a massive treehouse (complete with bar), and people bring their dogs and get food from the trucks and drinks from the bars and have an amazing picnic. The weather was impossibly gorgeous for mid-December, and Jennie and I brought about 50 pounds of classic Italian cookbooks to begin dreaming. We knew we wanted the theme to be The North and The South…an exploration of how vastly different the cuisines of Italy are between these two regions. As a very special treat, we flew in our buddy Adrien Nieto, who you’ll recognize as the 2nd place winner from our season of MasterChef. 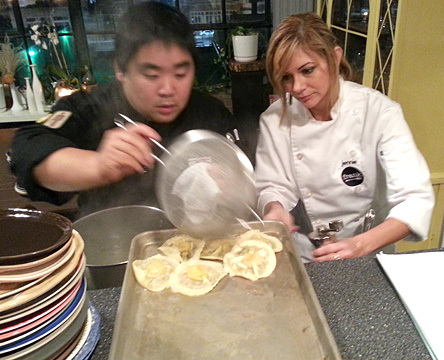 Our normal sous chef, Natalie, was out of town for the holidays, and we needed someone brilliant and skilled. Then, to our surprise, the incomparable Alvin Schultz notified us that he would be in Dallas for NYE, so we pre-empted him to help with that night. It turned into a spontaneous MasterChef reunion. We knew we’d have to do oysters again for the amuse-bouche. It’s so traditional for NYE, and our oyster purveyor always has such an amazing selection. And Italians love oysters, especially in the South. But instead of the typical French mignonette (a tangy sauce for oysters with shallots, Champagne and vinegar), Jennie decided to Italianize it by adding some minced basil and using Prosecco (Italian sparkling wine) instead. And while it’s customary to serve oysters with Champagne, we decided to offer a special cocktail this year…a play on the classic “French 75” which is gin, Champagne, lemon, simple syrup, and bitters, but we turned it into an “Italia 75” by using vodka, Prosecco, lemon, simple syrup, and a very, very special housemade bitters we’ve been working on. Some of you have seen my videos visiting the oldest trees in the world, the Bristlecone Pines. These trees live on high desert mountaintops in the American Southwest in California, Nevada, and Utah. Because they live in a hostile environment, high above the tree line where other trees stop growing, in blasting winds and with as little as 3 inches of rain a year, these trees grow very, very slowly for incredibly long periods of time. The oldest Bristlecones have been alive for over 5,000 years, meaning they were already 500 years old when the great pyramids of Egypt were built! They have witnessed virtually the entire march of human civilization. (I have to place a disclaimer here, because someone is going to claim there are much older trees alive in both the US and Scandinavia, but these are clonal trees, meaning their root systems may be 10,000 to up to 1m years old, but the actual trees you see above the ground live no more than 500-600 years.) So when you approach a Bristlecone Pine, you’re looking at a tree that has been alive for many thousands of years. If you haven’t watched my videos on them, you can watch this short one, and there’s another one here. So what does this have to do with our FRANK menu? 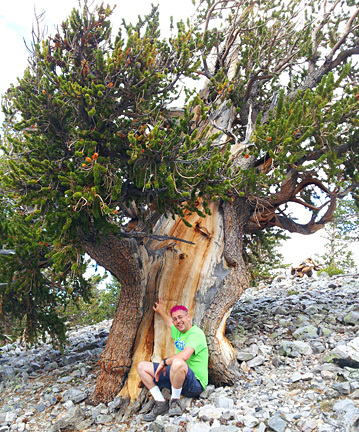 On a recent trip to Burning Man this summer, my buddy Ross and I stopped to visit the oldest grove of Bristlecone Pines, high atop the White Mountains in the Inyo National Forest in remote eastern California near the Nevada border. And as you saw in the video, the trees were producing cones that were overflowing with sticky, pungent sap. I gathered a few downed cones and did a double extraction on them with grain alcohol…first, an 8-hour extraction to remove that rich sap, resulting in a golden, piney tincture…and then a 3-week extraction to remove woody, bitter compounds from the cone wood itself. I combined these two tinctures carefully with 2 other tinctures I made from Texas juniper berries (from the trees in the park behind my house) and from Cascade hops I grew in my garden. And thus was born what may well be the most epic bitters ever made…Bristlecone bitters, the essence of the oldest trees in the world. (With NO harm done to the actual trees, I must emphasize!!!) So this very special cocktail accompanied our oyster to complete a Southern Italian course for the amuse-bouche. For the next course, we wanted to do a salumi plate. “Salumi” is the Italian word for cured meats. (You may be more familiar with the French word “charcuterie” which means the same thing.) One of our mentors at FRANK is the legendary French chef André Bedouret, famous in this part of the country for his classes on meat curing. Chef André was present at the very first FRANK almost 2 years ago, and we can always rely on him to give us his very French (ie…VERY honest) opinion about things! He always challenges us to move to new levels of competence and vision. 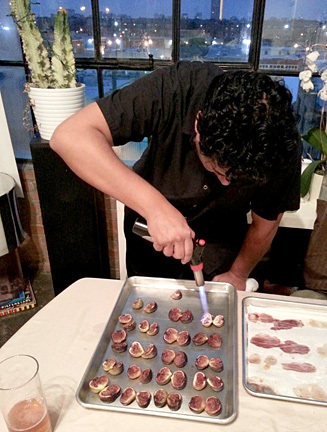 We were incredibly fortunate to acquire some of his spectacular cured meats to serve for this course. The first was lonzino, which is the cured loin muscle of the pig. This lean, tender cut cures out to an incredibly silken texture, and Chef André used some warm spices like nutmeg in the salt rub. The second was coppa, which is more commonly called cappicola here in the US. This muscle comes from the neck of the pig, and has big regions of pure white intramuscular fat which balance the texture of the neck muscles which are frequently exercised (and can therefore be tough, but incredibly flavorful…and when sliced thinly, renders one of the most extraordinary types of salumi). And the last was a spicy cured sausage, the most challenging of all meats to cure properly, somewhat similar to salame, where our English word “salami” comes from. Each one of these meats was truly incredible, and when we called for a vote each night on which was the crowd favorite, a solid winner never emerged…they were THAT good. We served the salumi with a housemade cheese we’d been curing for several months, in the style of an Italian ricotta salata, or “salted ricotta.” This is NOTHING like the ricotta you’re familiar with…this is an aged, firm cheese that begins its life as fresh ricotta, and is then salted and pressed, and carefully aged. In fact, because this cheese starts out as a fresh cheese that anyone can make at home, this is an excellent starter cheese if you want to learn to make aged cheeses. You can read my blog post here on how to make it. Traditional ricotta salata is not flavored with anything other than salt, but we added a liberal amount of cracked black pepper to the cheese before pressing it, and then we cured it on the outside with a bleu cheese mold to transform the flavor and texture. 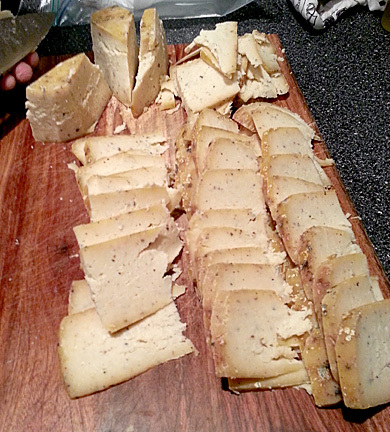 We called the resulting cheese “black and bleu ricotta salata” and our diners loved it. 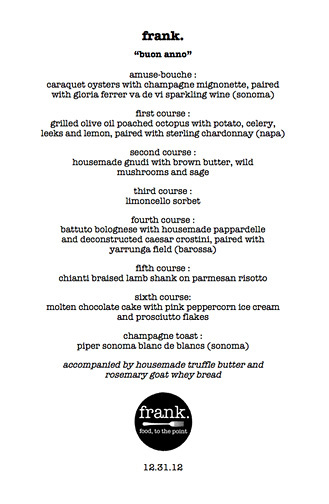 And, as with so many ingredients at FRANK, the only place in the world you can taste it is…at FRANK. This course was typical of southern Italy. While salumi is made all across the country, pigs tend to be raised more often in the warm south, where cattle are rare, and salumi tends to be more boldly spiced. They grow exclusively in the wild and no one has figured out how to cultivate them, so every porcini mushroom eaten anywhere in the world was found in the wild by a mushroom hunter. 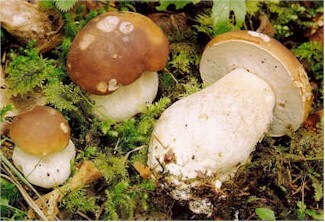 In the US, porcini are called by a portion of their scientific name, boletus edulis, or more commonly, boletes. They are found most commonly on the west coast, and this is the prime season for California boletes. However, because of the awful, unprecedented drought happening there, not many boletes are being found this year, so we used dried boletes. (Many species of wild mushroom lend themselves very well to drying, boletes and morels among them. And this is the only way they can be used outside their normal growing season.) Boletes can also be found wild all across the US, including Eastern and South Texas, primarily in the spring. Many, many people believe that boletes or porcinis are the most delicious of all wild mushrooms species, with their earthy, spicy flavors. Chestnuts are a fixture in the holiday season here in the US. They pop up in the song lyrics we hear all season: “Chestnuts roasting on an open fire…” and “We’ll be singing the songs we love to sing without a single stop, at the fireplace while we watch the chestnuts pop!” In northern cities, people look forward to sidewalk chestnut vendors during the winter who serve these creamy, rich nuts freshly roasted. In Texas, however, chestnuts aren’t nearly as prevalent, so my very first taste of chestnuts was in New York in my mid 20s. All it took was one taste to fall in love with these extraordinary nuts, which are typically imported from either Italy or Korea. Chestnut trees used to be widespread in the US, but in the early 1900s, a disease called chestnut blight wiped out nearly all of the 4 billion trees across the country. Today, it’s incredibly rare to run across a mature chestnut tree, though genetic scientists are engineering a blight-resistant tree with genes from Asian chestnut trees, and new domestic chestnut orchards are being planted. (Unfortunately, this means that if you find US-grown chestnuts in your market, they are genetically modified.) If you’ve never tasted a chestnut, you don’t know what you’re missing. They must be roasted or boiled before eating, and I actually prefer cooking them the way my partner’s mother taught me: in my pressure cooker, and the extra moisture that method contributes to the nut fixes my only criticism of dry-roasted chestnuts…I find the nut meat a bit too dry with that preparation. Chestnuts are highly perishable, unlike other nuts, and are ONLY available fresh during the late fall and winter months. But chestnut flour (roasted, dried, and ground chestnuts) is available year round. Chestnuts are very sweet, with a creamy texture and unusually robust thickening power…a perfect base for a thick, luxurious soup. To bring together these two unique ingredients, we felt like the perfect bridge would be the parsnip, as it is both sweet and creamy, and earthy and spicy. So with our sacred trio, we pushed forward with this creative soup, finishing it with olive oil, celery leaves, fried leeks, and a dollop of luscious housemade mascarpone cheese. And although it had some competition on the first 3 nights, on our New Year’s Eve seating, the majority of our diners said it was their favorite course and they had never tasted anything like it. The ingredients in this soup are all typical of northern Italy’s mountainous, cool climates, where porcini grow in abundance, chestnut orchards are common, and parsnips mature slowly in the long, cool autumn months. The rampant mispronunciation “mar-sca-pone” came from I-don’t-know-where. The “r” comes AFTER the “sca,” not before. But Americans seem to love randomly moving letters inside words, much the same way they move the “l” in chipotle, thus rampantly mispronouncing it “chi-POL-tay.” (The only correct pronunciation of chipotle is “chee-POTE-lay.”) So make me a solemn promise that you will only correctly pronounce mascarpone from now on, okay? Thanks! I love you. Next up was a polenta course. Jennie and I both love polenta so much, we just have to serve it any time we have an Italian menu. Polenta is similar to our Southern grits…coarsely ground corn cooked slowly into a hearty porridge, then traditionally finished with a cheese like Parmigiano-Reggiano. Polenta is typical of the south of Italy, where corn is grown in the long, hot summers, and we decided we wanted to serve it with giant prawns, a common food in the Mediterranean regions. 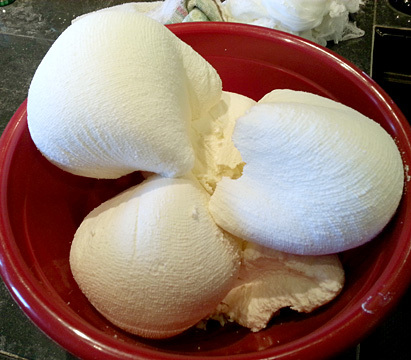 We were lucky to be able to source truly massive ones, nearly 1/4 pound EACH! But cooking a shrimp that big is challenging, because by the time the meat in the center of the shrimp is done, the outside is overcooked and incredibly rubbery. Really the only way to perfectly cook a shrimp this size is sous vide, or cooking it inside a vacuum sealed bag in a temperature-controlled water bath. But before this, we gave them a 30 minute brine to get the meat seasoned perfectly and incorporate a bit more water into the meat to ensure even cooking. Then they were vacuum sealed with olive oil, tons of garlic, and spicy red pepper flakes, and immersed in a 132F water bath for 45 minutes. This cooked them through perfectly. Then we chilled them overnight before peeling and de-veining, and finished them in a pan briefly with some olive oil, garlic, and black pepper to get a nice sear on the outside just before serving. 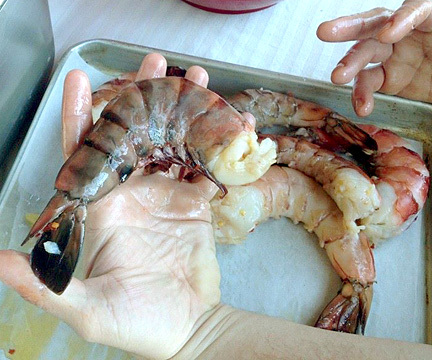 That’s a LOT of work, but with prawns this big and beautiful, it’s really the only way to do it! Very few of our diners had ever seen shrimp this big before, and they loved digging into a lobster-sized shrimp on top of ultra-creamy polenta filled with black winter truffle (a classic Italian ingredient) and Parmigiano-Reggiano, with some arugula folded in at the last minute. 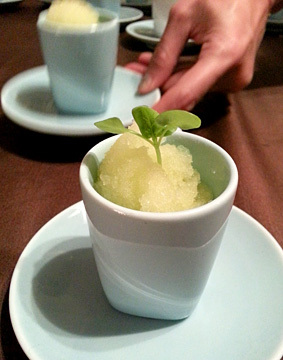 It was truly divine…one of my favorite courses we’ve served at any FRANK so far! Many Italians will tell you that the secret to perfect polenta is to stir, stir, stir constantly while it is cooking. But I learned from a Sicilian grandmother famous for her polenta that the real secret is the EXACT OPPOSITE. Don’t stir it. At all. Put it in the oven on low temperature, and let it bake…low and slow…for hours…and don’t you dare touch it! Not only does this result in a polenta with a far better texture than a stirred polenta, it’s way easier, as well! So all our FRANK polenta is now served this way, thanks to her! While we’re on the subject of prawns vs. shrimp…there is officially NO distinction between the two in terms of vocabulary. The words can be used interchangeably to describe any size or species of shrimp. Colloquially, the term “prawn” tends to be more popular in Australia and the UK, and “shrimp” is more popular in the US. Here we tend to refer to really big shrimp as “prawns” even though that’s an erroneous association on our part. Some people call fresh-water shrimp species “prawns” and those that live in salt-water “shrimp,” though the official name for what we served is “tiger prawn” and they are raised in salt-water or brackish water and can’t survive in fresh water for very long. Female tiger prawns can grow up to 3/4 of a pound and more than a foot long! Now that’s a real monster! 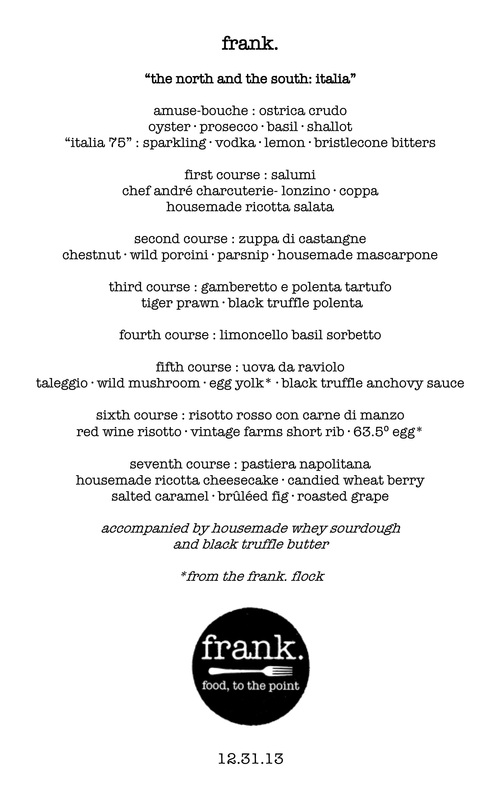 After that lovely break, it was time for a course we’ve always wanted to serve at FRANK, but were a bit scared to. But with Adrien and Alvin for reinforcements, we decided now was the time. 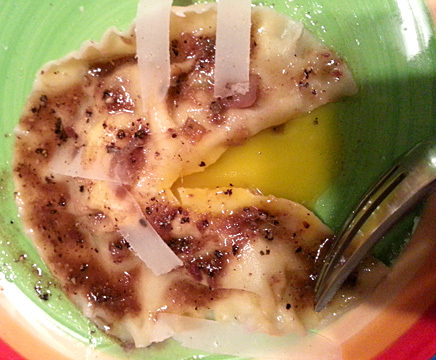 Uova da raviolo, a giant ravioli with a barely-cooked egg yolk inside, and when you cut into it, the yolk runs out and mingles with the sauce…about as decadent as any pasta gets. This pasta is not easy to make. To be truly sophisticated, the dough must be rolled paper-thin, which makes it challenging to work with, especially when made with semolina flour…the traditional flour for flat pasta sheets in Italy. Semolina is a lovely golden color, and is ground more coarsely than the “00” flour used to make other fresh pastas. 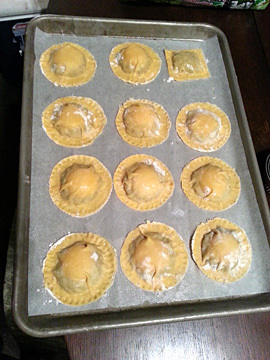 After rolling, the pasta sheets have to be kept in a humid environment to prevent them from drying out while you cut and fill the ravioli. The filling we made from a variety of wild mushrooms, sauteed in butter with shallots, and then we folded in Taleggio, a pungent, soft cheese from the Lombardy region of Northern Italy. (Complementing the also-northern wild mushrooms and shallots.) Taleggio is incredibly stinky when you smell it, but when you put it in your mouth, the scent disappears and it becomes creamy, mild, and fruity. It’s absolutely gorgeous with mushrooms, and this creamy nest of earthy goodness became the throne for an egg yolk from my backyard chicken flock. 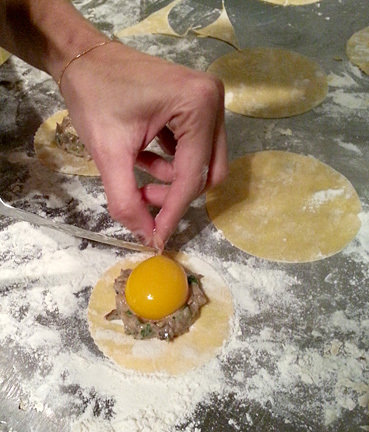 The edges of the pasta are then moistened, and a disc of pasta slightly larger than the bottom disc is placed on top, the air is carefully pressed out, and the raviolo is sealed around the edges. Then the raviolo is blanched in olive oil and water just below the simmer for exactly 2 minutes, resulting in a yolk that is just barely cooked and will run when sliced. Due to the risk of the raviolos breaking apart or sticking together in the water, you have to cook them only 2 or 3 at a time in a huge pot. This is no easy process, especially when you’re feeding a crowd of 18! If you’d like to try your hand at the queen of all pastas, my recipe can be found here, though our filling and sauce was different at FRANK. We served the raviolo with an anchovy shallot sauce, pungent and salty, but when the egg yolk met it…absolutely breathtaking. Definitely the most complex dish we’ve ever served at FRANK, both in terms of preparation and flavor. It’s so amazing you tend to want more than just one, but it’s so rich and explosive in flavor, one is all you can really handle! Next up was the “main course,” as if anyone needed more food than what came before! But when it’s this amazing, you find a way to make room. Braised USDA Prime beef short ribs from Vintage Farms, the farm owned by the family of our friend Clark at Arrowhead Specialty Meats, who often supplies us with incredible meats for FRANK. (He does sell to the general public, though you’ll have to buy a whole brisket, pork shoulder, tenderloin, etc. and you won’t be able to buy just 1 or 2 steaks.) This meat was truly the best beef Jennie and I have ever worked with. 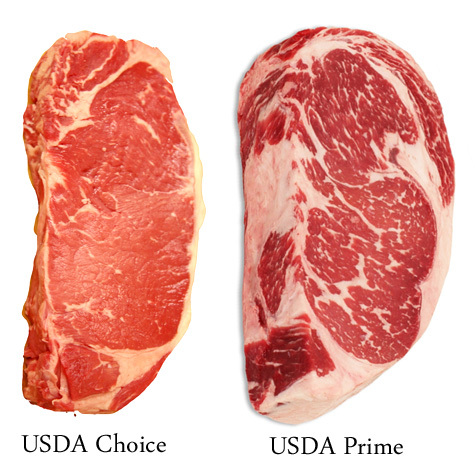 The USDA grades beef exclusively by the amount and quality of intramuscular fat distributed throughout the muscle tissue. The higher the grade, the more fat content, and the better distributed it is throughout the muscle fibers. (This is called marbling.) And while many people equate fattiness with something bad, virtually EVERYONE would choose a Prime steak over a Choice steak, because it’s BETTER. So let’s dispense with the fear of the word “fatty” when it comes to meat. If you choose to eat beef, you’re choosing to eat something that’s high in saturated fat, so let’s realize that we’re indulging and not be negative about it! These were the fattiest short ribs I’ve ever seen, and while we rendered and skimmed off most of the fat from the ribs (I’m going to make candles with it! ), the braised rib meat was so succulent it basically dissolved on the tongue. We braised the ribs at 200F for 8 hours with onions, garlic, carrots, parsnips and turnips, for a wonderful wintery taste. Then, after defatting it, we reduced the braising liquid to concentrate the flavors. We picked over the meat, removing the bones and reserving them for stock, and setting aside the gelatin-rich connective tissues that would ordinarily be a little chewy. These we pureed in the Vitamix with the reduced braising liquid to make a gravy thickened, not with starch, but with gelatin from the animal itself. It was just downright sinful, silken and impossibly rich. The braised short rib sat on a bed of risotto rosso, a Northern Italian specialty. Rice is grown in the north, so risottos are common there. (Cows are also raised in the mountains of the north, but are rare in the hot south, so this was decidedly a Northern Italian dish.) 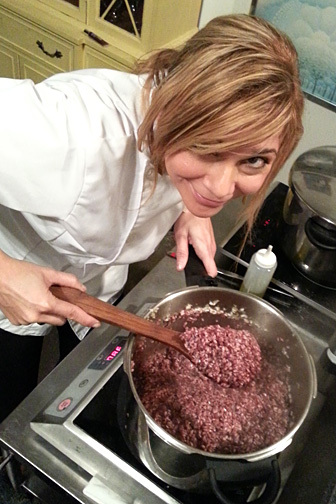 Risotto recipes commonly call for white wine, but a risotto rosso uses red wine, tinting the dish a lovely dark pink or light purple. To deepen the color and flavor, we reduced a couple of bottles of red wine (a Montepulciano d’Abruzzo) down to the 2 cups of red wine normally called for in the recipe, and then folded in a truly ridiculous amount of Parmigiano-Reggiano at the end, resulting in a stunning red risotto to match the short ribs in flavor and richness. As if that wasn’t enough, we topped the dish with a 63.5 degree egg. If you read my last blog, you learned about this extraordinary preparation for eggs. 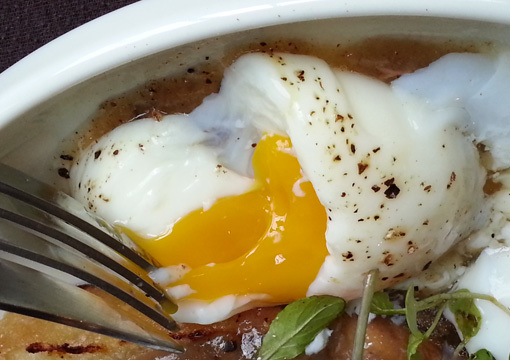 Proteins in the egg begin to coagulate (ie “cook”) at 63C or about 145F. But we typically cook eggs at FAR higher temperatures, closer to the boiling point at 220F, or even higher if we fry or scramble them in a pan. This means we’ve been overcooking eggs for all these centuries. New technologies in the kitchen like the Immersion Circulator allow us to poach eggs inside their shells at a very precise, appropriate temperature far lower than we have done historically, meaning we can cook an egg properly for the very first time in history. When you cook an egg at just above its coagulation temperature for an hour, it becomes this delicate, uniform, custardy texture all the way from the white through to the yolk. It’s sinful, and our guests are responding to it as if they’ve just learned that there really IS a Santa Claus. Putting this indulgent egg on top of everything already going on in this course…there’s just so much about this dish that’s so, so wrong yet fundamentally, universally, hedonistically right…I’m honestly not sure we’ll be able to surpass it with other FRANK main courses. It wasn’t incredibly complex…just traditional and simple, but with the finest of ingredients. A truly magical plate. And finally…dessert. While Italy is known for a wide variety of desserts, none of them really rise to the level of indulgence and sweetness as American desserts. And FRANK tends to be known for some fairly indulgent desserts. 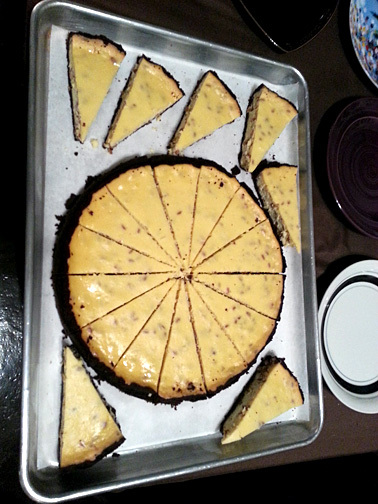 But we wanted to stay traditional and feature something that very few Americans would be familiar with, so we chose pastiera, a unique cheesecake from Naples in the south of Italy. Pastiera is a lightly sweet ricotta cheesecake with wheat berries baked into the cake. It is typically only served at Easter in Italy, but in MY Italian-Brazilian family, they serve it during the holidays. We used spelt instead of true wheat…spelt is a very ancient relative of wheat indigenous to Central Europe, and hasn’t been heavily genetically modified, like most of our American-grown wheats. We first soaked the spelt overnight, then cooked it in the pressure cooker until it was soft. Then we simmered it very slowly for a few hours in cream and sugar, and the berries swelled and grew sweet and rich. We folded this into a housemade ricotta with plenty of eggs, vanilla, and lemon zest, and baked it in a very nontraditional chocolate crust. Why chocolate? Well, we just didn’t have the heart to present a NYE dessert without ANY chocolate on the plate! We topped the pastiera with a decadent salted caramel sauce, and served it with candied, bruleed figs and fresh grapes doused in a very special cold-pressed olive oil from a friend’s family orchard in Sicily. It wasn’t so rich you felt terribly guilty after eating it, but many of our diners said it was their favorite course and just couldn’t get over the unique texture of the ricotta cheesecake with the candied wheat berries inside. Our NYE guests were also given a special parting gift…Sourdough Chocolate Panettone. Panettone (PAN-uh-TONE-eh) is a traditional holiday sweet bread from the Milan region. It is baked in a round mold, so it looks more like a giant muffin than a loaf of bread. 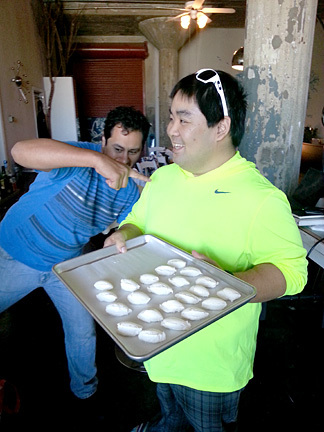 Historically, it has been made with sourdough starter, but commercial versions are not. Well, ours certainly was! While traditional panettone contains dried fruit, the most popular panettones these days are filled with chocolate, so we folded dark chocolate into the dough from Valrhona, a French chocolate manufacturer that produces what is widely recognized as the best chocolate in the world. Ultimately it was our most ambitious menu yet, 8 full courses including the amuse, plus a parting gift, and our thoroughly-stuffed diners toasted the New Year with us with a beautiful prosecco that won Jennie and I over after tasting dozens. Exhausted, we collapsed for a few hours before spending the day wrapping up so that Adrien and Jennie and I could get on the road for the west coast the next day…but that, as they say, is a different story! Please feel free to comment below, and if you’re interested in dining at FRANK, please visit our website! To read more about FRANK, click here for a list of blog posts about our more interesting menus!